This Chinese calligraphy wall scroll features the two Chinese characters used to convey honesty.. 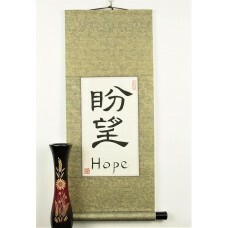 The characters for "hope" in Chinese make an excellent Chinese calligraphy wall scroll. The cha.. There are several words in Chinese that can be translated into "hospitable" in English, probabl.. This Chinese calligraphy wall scroll features the characters used in the Bible for the virtue .. This Chinese calligraphy wall scroll features the Chinese symbols for "imagination" or "creativ.. This two character Chinese calligraphy wall scroll features the symbols for "independent." This.. This four character Chinese calligraphy wall scroll can be translated as "indomitable." It real.. This Chinese calligraphy scroll displays four characters, which taken together mean "industriou.. This scroll represents the Chinese virtue of "inner peace." Literally it means "inside heart pe.. This two character Chinese shu fa wall scroll means "upright" and "righteousness." Taken togeth.. This Chinese calligraphy wall scroll features the characters for "kindness." These are the same.. This Chinese calligraphy wall scroll is a popular item for those who want to give good wishes t.. 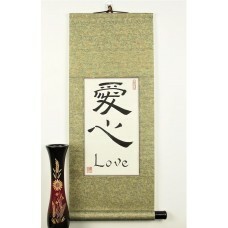 This Chinese calligraphy scroll features the symbols for love. This is the greatest virtue in t.. This Chinese calligraphy scroll features the symbols for loyalty. This important virtue is also..